Numerous studies have suggested that caffeine has many health benefits. Now, new research suggests that a dose of caffeine after a learning session may help to boost long-term memory. This is according to a study published in the journalNature Neuroscience. The research team, led by Daniel Borota of the Johns Hopkins University in Baltimore, notes that although previous research has analyzed the effects of caffeine as a cognitive enhancer, whether caffeine can impact long-term memory has not been studied in detail. To find out, the investigators analyzed 160 participants aged between 18 and 30 years. On the first day of the study, the participants were shown pictures of different objects, and were asked to identify them as “indoor” or “outdoor” items. Soon after this task, they were randomized to receive either 200mg of caffeine in the form of a pill, or a placebo tablet. From this, the researchers found that subjects who took the caffeine were better at identifying pictures that were similar, compared with participants who took the placebo. However, the researchers note that both groups were able to accurately distinguish whether pictures were old or new. New research suggests that consuming 200mg of caffeine a day may boost long-term memory. The team conducted further experiments using 100mg and 300mg doses of caffeine. They found that performance was better after the 200mg dose compared with the 100mg dose, but was there was no improvement after the 300mg of caffeine compared with 200mg. “Thus, we conclude that a dose of at least 200 mg is required to observe the enhancing effect of caffeine on consolidation of memory,” the study authors write. The team also found that memory performance was not improved if subjects were given caffeine 1 hour before carrying out the picture identification test. They investigators say there are many possibilities as to how caffeine may enhance long-term memory. For example, they say it may block a molecule called adenosine, preventing it from stopping the function of norepinephrine – a hormone which has been shown to have positive effects on memory. They note that further research should be conducted to better understand the mechanisms by which caffeine affects on long-term memory. According to the latest figures from the US Food and Drug Administration (FDA), the average American consumes 300mg of caffeine a day. The main sources of the compound are coffee, tea and soft drinks. 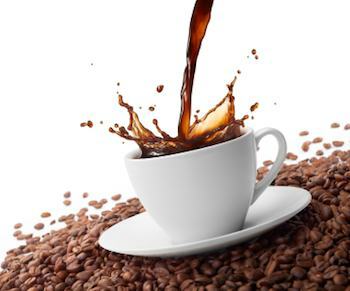 Many studies have suggested that caffeine offers health benefits. Last year, Medical News Today reported on a study suggesting that caffeinated drinks may reduce the risk of liver disease, while another study says drinking 2-4 cups of coffee a day may reduce suicide risk. But it is not all good news. One study suggests that the stimulant is able to disrupt sleep patterns hours after consuming it, while another proposes that caffeine from energy drinks may alter heart function.